Being able to join a growing firm which is enthusiastic to develop a strong pro bono and CSR program is a rare opportunity. Emily is a senior associate in our Insurance & Health team and Barry.Nilsson’s national pro bono manager. Emily joined the Melbourne office in 2017. Having practised at other leading insurance firms in Melbourne for nearly 10 years, Emily specialises in complex and high value professional indemnity claims. Emily’s practices focuses on professional negligence claims acting for financial advisors, directors and officers, solicitors and law firms, and construction professionals. Emily works closely with her clients to guide them through the legal process in a way which is tailored to their business. In addition to her insurance practice, Emily, as national pro bono manager, will further develop and strengthen the pro bono and corporate social responsibility program at Barry.Nilsson. Emily sat on the Justice Connect Secretariat for the last 3 years and was on the board of vivaRCH from 2010 to September 2016. VivaRCH (or Viva Royal Children’s Hospital) is an extension of The Royal Children’s Hospital’s Auxiliaries’ volunteer network. 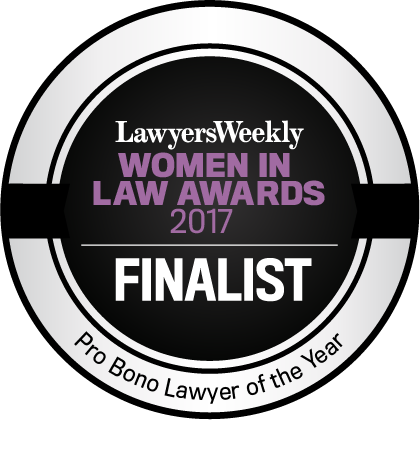 In 2017, Emily’s dedication to pro bono initiatives was recognised when she was named as a Finalist for the Lawyers Weekly Women in Law Awards in the category of Pro Bono Lawyer of the Year. Emily has a Bachelor of Laws and Bachelor of Arts. She is a member of Women In Insurance (WII), Australian Insurance Law Association (AILA), National Association of Women In Construction (NAWIC), Law Institute of Victoria (LIV), Australian Professional Indemnity Group (APIG) and Victorian Women Lawyers (VWL).